Chemistry X | Acids, Bases and Salts | WHAT DO ALL ACIDS AND ALL BASES HAVE IN COMMON? WHAT DO ALL ACIDS AND ALL BASES HAVE IN COMMON? In Section 2.1 we have seen that all acids have similar chemical properties. What leads to this similarity in properties? We saw in Activity 2.3 that all acids generate hydrogen gas on reacting with metals, so hydrogen seems to be common to all acids. Let us perform an Activity to investigate whether all compounds containing hydrogen are acidic. Take solutions of glucose, alcohol, hydrochloric acid, sulphuric acid, etc. Fix two nails on a cork, and place the cork in a 100 mL beaker. Connect the nails to the two terminals of a 6 volt battery through a bulb and a switch, as shown in Fig. 2.3. Now pour some dilute HCl in the beaker and switch on the current. Repeat with dilute sulphuric acid. Does the bulb glow in all cases? 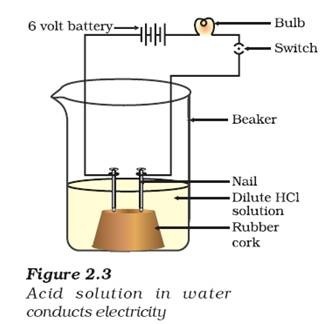 The bulb will start glowing in the case of acids, as shown in Fig. 2.3. But you will observe that glucose and alcohol solutions do not conduct electricity. Glowing of the bulb indicates that there is a flow of electric current through the solution. The electric current is carried through the solution by ions. Since the cation present in acids is H+, this suggests that acids produce hydrogen ions, H+(aq), in solution, which are responsible for their acidic properties. Repeat the same Activity using alkalis such as sodium hydroxide, calcium hydroxide, etc. What can you conclude from the results of this Activity?